This week, I sat on top of her until she agreed to bestow her knowledge upon me. Who: Miss Ireland, superstar PE teacher and Head of Dance at Tully State High School, as of January next year. Previously a wake-boarding, cross-fitting, swimming, dancing, studying genius. Currently (for the next 2 days) the receptionist and Chief Cool Chick at the gym I attend. Soon to be sorely missed. Strengths: Unfathomable maturity and intelligence for such a young brain. Best eyebrows ever. Flaws: Paralysing fear of cane toads. After a year of almost-daily chats, this is the only flaw I have discovered. Triathlon Experience: Miss Ireland undertook serious swimming training until the age of 7, when she realised that swimming is stupid. Instead, she became a swimming coach so as to inflict pain upon others, because she is smart. Further to this, Miss Ireland has owned a road bike for many years and can actually ride it, even one-handed so as to be able to signal. She also runs without pain when she feels like it, which granted is not often because she is not sick in the head like I am. Finally, Miss Ireland has completed the same Bribie Island Triathlon that I will be attempting in February. So she knows what I will be facing. The Plan: A few weeks ago Coach Ireland cleverly suggested that at some point in my training I should go for a swim at Bribie. You know, the place where I will need to be able to swim for the triathlon. She also suggested that I should not go by myself, which left her between a rock and a hard spot where she basically had to volunteer herself to go with me. Sucker. But First: But first we agreed to meet in the pool. Partly because I felt it was necessary for my new coach to see what she was dealing with in terms of likelihood-to-have-to-transport-a-dead-body-home, but mainly because one of us was wise enough to think of checking the tides and working out what day would be best to go to the beach, and that turned out to be late in the week. Note to self: Should try and work out how to read tide charts. In the Pool: The session began with half a length of freestyle and a demonstration of my electrocuted starfish impression. Much like Kirk, Miss Ireland was unphased and even said ‘you’re not that bad’ which she came to regret later. We did lots of drills with floats and cool names that I can’t remember, mainly focusing on my breathing because I am exhaling like I am blowing up a balloon and inhaling like it is the last breath I’ll ever take in my life. Which is hard to do 300 times without, well, dying. It didn’t go too well but I learned valuable information and made Kirstie laugh a few times, so hopefully the entertainment value was worth it for her. At the end, I asked Kirstie to show me a lap of swimming by herself and it was so exciting for me to see real grace and perfection in the pool. It inspired me to believe that swimming comfortably is an achievable thing – Kirstie made it look so easy. I was excited. Luckily I was able to get back in the pool the next day by myself, to practice the tips she had given me before heading out to Bribie. 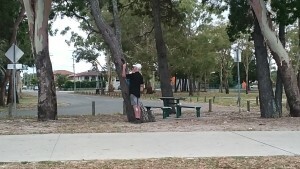 Off to Bribie: We agreed to meet at a car park near the motorway exit on the road to Bribie, so as to take one car. 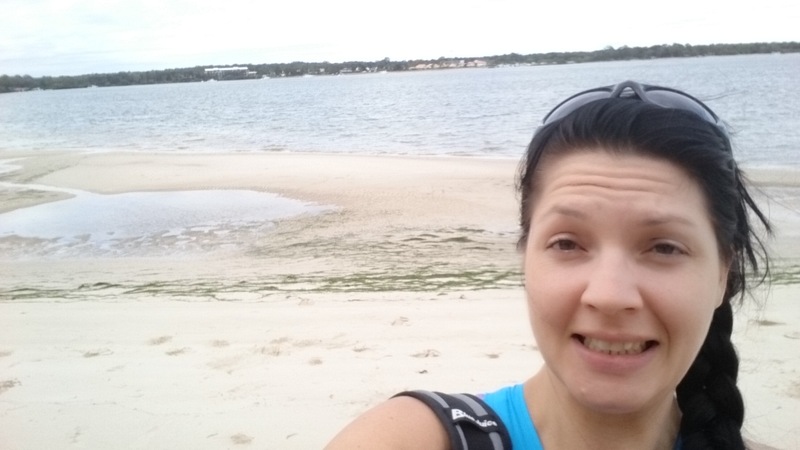 Bribie is a smallish island off the coast of Queensland, but is accessible by car over a bridge. We would be swimming in the passage between Bribie and the Australian mainland, where the race will also take place. 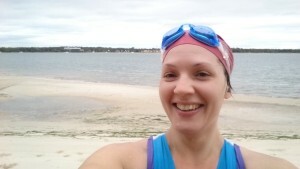 I assumed that we wouldn’t meet many people at the beach that early, so I bravely donned my Triathlon Suit for only the second time in my triathlon career and the first time ever in a public place (IE outside of my lounge room) because I guess I need to know I can swim in it. Too Late to Back Out: I was so nervous on the way to Bribie, I was once again reminded that I am going to be an absolute wreck on race days. I am glad my mum will be accompanying me as Chief Sherpa on the day (because my Stepdad, Blob, volunteered her for the role) as I’m sure if Shane were coming we’d have fisticuffs over something banal before we made it to the start line. I mean, I’m going to be unbearable, but mum lived with me when I was a teenager so I know she can take it. As we parked in the car park next to the Surf Life Saving Club, the reality of what I had signed up for finally, truly, set in. It was windy and looked like it was about to storm. Kirstie agreed that yes, when she had checked the forecast it said ‘thunderstorm’ and she had almost messaged me to postpone. I chided myself for not even thinking to check the bloody weather. I could have got out of this stupid thing. I looked to the sky and hoped for a sudden crack of thunder. Nothing happened. I was really going to have to get in that murky, choppy water and swim. A Welcome Distraction: We walked along the beach so that my superstar coach could work out the direction of the current and a bit of a route for us to swim along. She pointed out some key areas that will be handy for me to know in future such as the spot where my Transition will be (IE where my bike will be parked waiting for me after the swim) and I am sure this will help me to feel more comfortable on the big day. We found a place to leave our bags and started getting undressed and then dressed again in our swimming caps and goggles. Out of nowhere, I heard a man’s voice ask me if I was ready for my breakfast. My heart skipped a beat – yes, I was really hungry! 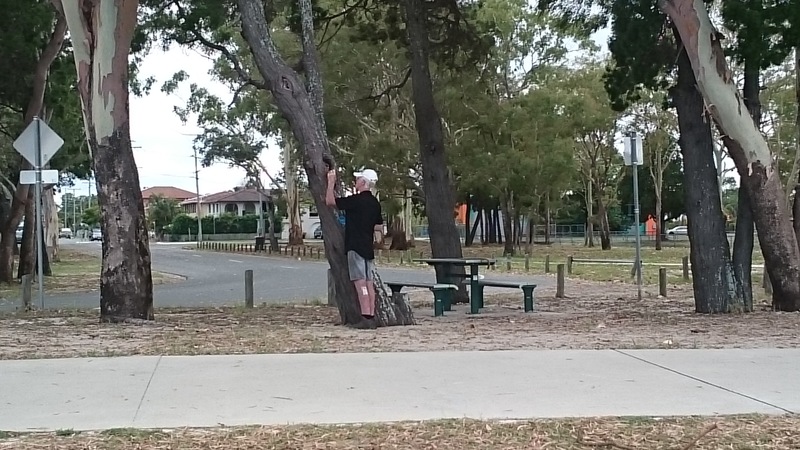 I looked up excitedly, but the man who was talking was looking at a tree. Kirstie and I glanced at each other and mumbled under our breaths. Was he talking to a tree? Was he going to feed it? Before we could make a run for it, a small possum poked his head out of a hole in the trunk and the man reached in and gave him some kind of delicious breakfast, which was greedily taken into the nest. I got my camera out and pretended to take a selfie of myself whilst actually snapping the man and his possum. In The Sea: There was no more delaying it. We waded into the water and I was silently pleased that Kirstie found the water much colder than I did. Possibly my heart was beating so hard I was overheating and about to pass out, so the cool water actually helped me. I doubt it was a case of me being hardier than Kirstie, but it boosted my confidence. We made our way in waist-deep and then Kirstie took a dive and just went for it like a real mermaid. I attempted to copy her, ducked my head under and immediately panicked, came spluttering up. Wow. I couldn’t even put my face in the water. I needed to slow down. The water was choppy from the high winds and the sand was all stirred up so we couldn’t see the bottom. I stood where I was and just practiced blowing bubbles into the water a few times. Then I put my whole face in. It was horrible. I talked at Kirstie about how I was feeling and what was going through my head, hoping that verbalising it would help to lessen its power. We discussed which way we would be swimming and how far, and I nodded appropriately. OK, let’s go! I said, too brightly. We headed off and my first 6 strokes were OK, but I felt uncomfortable thereafter. I decided to breathe on every second stroke instead of every third. I wanted to plow on, I just wanted to see how much I could do. I pulled myself as hard as I could with each arm, and as I took my 14th or 15th breath I noticed I could see the bridge to the left of me as I inhaled. The bridge that should have been behind me if I was swimming straight along the shoreline. I stopped and doggy paddled, looked around. I was swimming directly back to Australia and away from Bribie. Straight out to the middle of the passage with the sharks and jellyfish. I swung my head around to look back to shore, and saw Kirstie treading water watching me with a bemused look. ‘Er, come this way?’ She yelled. I laughed and started swimming again. After a few strokes, I panicked and had to roll onto my back and float for a few seconds. I tried to swim again, but only made it two strokes before I inhaled water and had to roll over again. The thought of heading out to the middle without meaning to had shaken me. I swam again and eventually made it to a spot where Kirstie was waiting for me. What a disaster. We exited the water and walked back along the beach to try the same thing again, but better. I didn’t feel good about it but I had no choice. We got back in and Kirstie pointed out the markers I should use to guide myself as I moved. I set off, and this time somehow swam directly in to shore; the complete opposite direction I’d wandered to last time. I pushed back out to sea and tried to continue, but again I panicked and had to roll on my back. We got out and tried again. This time, I did a bit better at staying on course because I stopped to check I was on track more regularly. I swam my heart out and didn’t panic. Well, until I got to the end of our course and THERE WAS SEAWEED. I think I actually screamed underwater, it terrified me. I definitely swallowed another litre of saltwater. Why did seaweed frighten the living daylights of me? I do not know. It was dark, whereas the sand was light. I possibly thought it was a shark. Or I am just terrified of the green stuff unless it is covering sushi. Whatever, I freaked out. We exited the water again, and trundled back up the beach. As we walked, Kirstie commented that everyone who walked past the beach while we did our walk would look at us and think we were dedicated triathletes. They’d be gone before we got in the water and drowned, so to everyone passing at that moment we would look really professional. We puffed out our chests and strutted around like we thought triathletes should. I did a Baywatch-style slow-motion run. And for some reason, getting back into the water felt much more enjoyable in that frame of mind. Kirstie said that this time, she would just swim beside me and keep me on track so that I could focus on swimming. We set off, and I felt her gently nudge me almost immediately as I apparently tried to swim back to mainland Australia. I did quite well, even if I do say so myself. I reached the end of our 100 metre length without too much trouble. OK, one more, I’m on a roll. We walked back to the start and got into the water. I felt confident. Again Kirstie stayed beside me, but this time I made sure to breathe on the side she was swimming so that I could watch her and guide myself according to how close I was to her. We swam, and swam, and swam. It was pretty good. Eventually the waves were washing over my face too much so I had to swap and breathe on the other side for a few strokes, and unfortunately I swam straight on top of Kirstie and stabbed her in the arm with my fingernails. Seriously, the whole channel with only one other person in there and I stabbed them. If anyone reading this is going to do the Bribie Island Triathlon in February, be warned: I will find you, and I will stab you. We stopped and I spluttered my sorries and felt very embarrassed, but Kirstie kindly said ‘That’s what I’m here for!’ and I thought, this girl is amazing. We swam on and made it to the end of our course with great success. I even turned and swam into the shoreline like a professional. We should probably have done another length to ensure we’d hit 600 metres (double the length I’ll need in the triathlon!) but I wanted to end on a high note that would leave me with a good memory so couldn’t risk another attempt. So we called it quits, took some selfies and drove home like champions. I now know I can swim at least 100m with confidence in open water. With lots more practice in the pool and hopefully at least one more try in the ocean, I should be all set for Bribie. Noosa is another story though…. 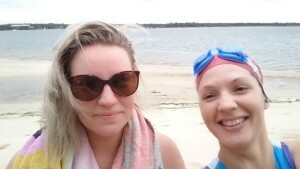 A Friend Indeed: I definitely wouldn’t have done an Open Water Swim (OWS) practice without someone there to encourage me, or at least notice if I died. Even small things like which direction to swim in or how far to go would have been a mammoth task for me to figure out. So I will be forever in debt to Kirstie/Miss Ireland/Coach Ireland for her kindness in taking me out to the passage for a swim on her precious morning off work. It is not the first time that she has helped me with something for which I cannot repay her, but I guess it may be the last because she will be going to Tully in a few weeks on an amazing adventure. Hopefully one day I can return the favours somehow, but if not then I know Karma is going to get her and shower her with wonderful things, because she is absolutely the most brilliant 22 year old I know. Good luck in Tully, Miss Ireland! This entry was posted in Show Me Swim and tagged bribie, coach, dying, newbie, swimming, training, triathlon. Bookmark the permalink. Yes, I loved this one too. Felt really there with you. Don’t go back on your own though. I am pleased you enjoyed it! I don’t think I would go on my own, don’t worry. I do want to survive to actually do the triathlon!